Click Cover to Order Virginia Page Fortna. 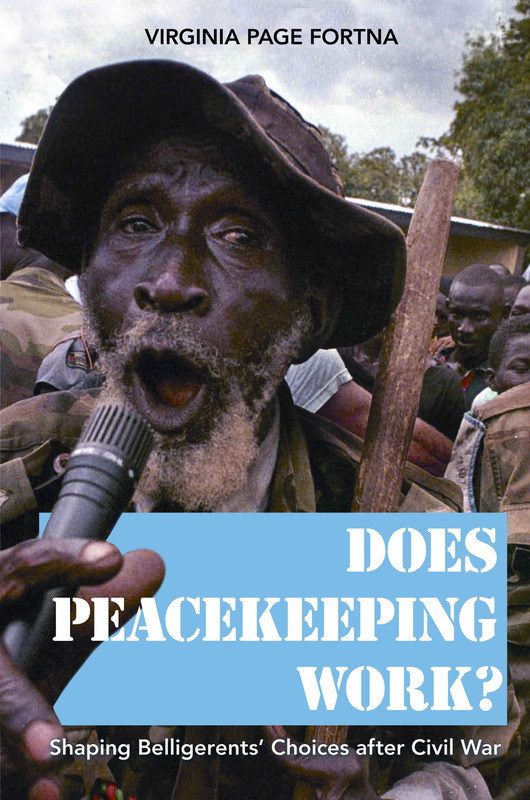 Does Peacekeeping Work? Shaping Belligerents' Choices after Civil War. In the last fifteen years, the number, size, and scope of peacekeeping missions deployed in the aftermath of civil wars have increased exponentially. From Croatia and Cambodia, to Nicaragua and Namibia, international personnel have been sent to maintain peace around the world. But does peacekeeping work? And if so, how? In Does Peacekeeping Work? Virginia Page Fortna answers these questions through the systematic analysis of civil wars that have taken place since the end of the Cold War. She compares peacekeeping and nonpeacekeeping cases, and she investigates where peacekeepers go, showing that their missions are crucial to the most severe internal conflicts in countries and regions where peace is otherwise likely to falter. Fortna demonstrates that peacekeeping is an extremely effective policy tool, dramatically reducing the risk that war will resume. Moreover, she explains that relatively small and militarily weak consent-based peacekeeping operations are often just as effective as larger, more robust enforcement missions. Fortna examines the causal mechanisms of peacekeeping, paying particular attention to the perspective of the peacekept--the belligerents themselves--on whose decisions the stability of peace depends. Based on interviews with government and rebel leaders in Sierra Leone, Mozambique, and the Chittagong Hill Tracts in Bangladesh, Does Peacekeeping Work? demonstrates specific ways in which peacekeepers alter incentives, alleviate fear and mistrust, prevent accidental escalation to war, and shape political procedures to stabilize peace. The cover depicts of member of the RUF, the main rebel group in Sierra Leone, speaking at a center for DDR in 2001, as the peace process got under way. It is cropped a bit too closely, but behind him are UN peackeepers. I chose the image because it puts the peacekept  one of the rebel soldiers  front and center. In my field research, I relied heavily on the views of the participants in the conflicts to learn how peacekeeping worked on the ground, and wanted an image that reflected that.